Experience the ultimate ski and snowboard vacation in the spectacular ski in/out residence located in Canyons Ski Resort, now part of Vail Resorts and the Epic Ski Pass. 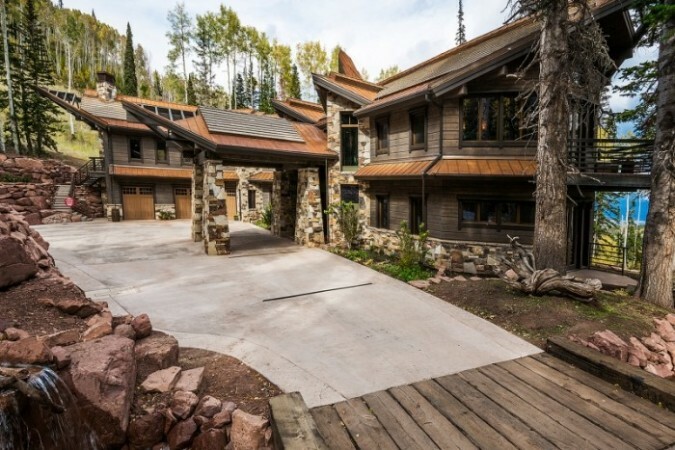 This brand new 11,400 square foot home is nestled on over 8 acres of mature pine and aspen forests within the Colony at White Pine Canyon; a presitigious gated community offering the utmost in security and privacy. Located at the intersection of Harmony, Royal, Solace and Elk Dancer ski runs, this home offers the ultimate in ski in/out flexibility with “First Tracks” downslope access to Dreamscape, Daybreak, Iron Mountain, and Tombstone lifts. Ski in is a breeze from Peak 5 and Daybreak Lifts. Designed by world class architects, 116 White Pine Canyon is the epitome of casual, organic comfort. The dramatic down valley and Uinta mountain views from the expansive 2 story wall- to-wall windows are breathtaking. A massive stone and copper indoor “ Firepit” in the great room is the quintessential spot to enjoy après ski or watch your favorite 3D movies. The open and inviting great room flows into the large gourmet kitchen and dining room with a table seating 14 and additional eating nook and island seating for 10. The fully equipped butler’s pantry is provided with separate entrances for ease of entertaining and catering. Boasting beautiful mountain views and king beds there are 6 bed/bath combinations rooms, two with Jacuzzi tubs and one with steam shower. Unique granite, stone and woodwork elegantly defines each and every bathroom. There is also a custom designed bunk room that sleeps 7 and a home office with views so nice you won’t be able to finish your work! Everyone will enjoy the spacious downstairs family room complete with a huge wet bar, Billiards, Ping-Pong table, Shuffleboard, game table, 2 large flat screen tv’s, 2 fireplaces, two full baths and separate home theater system. The home theater is complete with a 3D projection system, 90” screen and 7.1 surround sound system. The ski room offers convenient access to the mountains, sauna, hot tub and ski bath. The newly landscaped property boasts a cascading mountain stream which flows into a large pond surrounded by a spacious flagstone patio equipped with cozy lounge and dining furniture, a 6 person vite spa hot tub, sauna and a large gas fire pit. A wood-fired pizza oven and summer kitchen is a step away up the circular stairway to the covered deck off of the main kitchen. Property Bonus! Booking this property gives you a temporary membership to Club Lespri, Park City’s private world- class Boutique Inn, for the duration of your stay. At Club Lespri, you’ll enjoy exclusive access to the Club Lespri Rain Spa, Fitness Facility with on Staff Personal Trainers, and Lespri’s fine dining establishment, Cellars Prime Steak and Sushi.